When you experience an injury or accident, have had years of bad posture or your spine has degenerated over the course of many years, the natural result is pain. Your muscles contract and the discs in between your vertebrae start to deteriorate. Your nerves don’t have the space needed to reach the rest of your body and become compressed or pinched, which can affect not only nerves but the blood flow to the rest of your body, too. Once this compression happens, you’ll feel a burning and tingling sensation or shooting, stabbing pains. Spinal decompression is comfortable and feels amazing. This type of decompression isn’t like other tables that run on a motor. Instead, our computerized unit can sense how much your body and muscles are resisting the pull, slowly stretching out your body. The pressure will be removed from the nerve, and muscles can flow back into the spaces they belong in. The blood supply to your nerves is resumed, relieving your pain. In just 15-30 minutes on the table, your body puts itself back together without being compressed by the force of gravity. You’ll lie on a comfortable bed and be strapped in. Your hips and arms are supported as the table gently wraps around you like a cocoon. 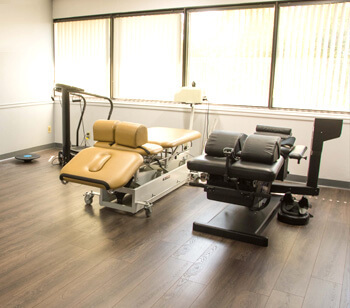 If you don’t respond to chiropractic adjustments or can’t have them because of back surgery that’s fused your vertebrae, spinal decompression can be a great option. Dr. Britton even uses our spinal decompression table when his back is tight or after a hard workout! Could spinal decompression be just what you need?